EU Law provides a comprehensive examination of the law of the European Union in two distinct parts, covering the institutions, structure and processes of the EU as well as the substantive law, as enacted by the Lisbon Treaty. 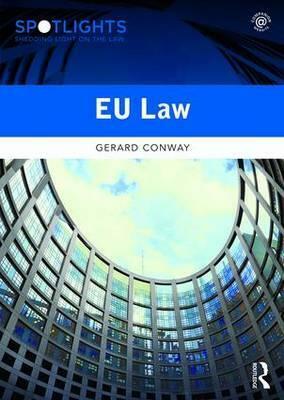 Beginning by examining its origins, Conway locates EU Law within both an international and a domestic legal context. He then explores the evolution of EU Law before providing a clear and accessible account of the structure and internal and international workings of the EU and the special role of the European Court of Justice. The second half of the book explores the Four Freedoms (of Goods, Workers, Capital and Movement) and provides a detailed account of Competition Law and the Economic and Social contexts. Gerard Conway is Lecturer in Law at Brunel University London.